Important notice: This page is under construction and product under development. Stay tuned.... Beta version should be available in mid-2017. Read more about progress at www.obdtester.com/starcom. 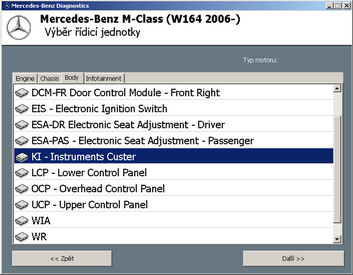 Mercedes-Benz diagnostics software allows you to perform complete diagnostics of all 1995-present Mercedes-Benz models. Diagnostics is performed via OBD-II connector (which is located near steering wheel) or via Mercedes-Benz proprietary 38pin connector (only older cars, pre-2001). Our PC USB diagnostics interface supports over 26 multiplexed K-Lines and Mercedes-Benz diagnostics CAN-BUS interface (also known as CAN-D). Unlike other universal Mercedes-Benz car scanner tools which only read fault codes, this software performs nearly ALL the functions like the original dealer diagnostic tool. Our Mercedes-Benz diagnostic interface contains K-Line multiplexor, CAN-BUS interfaces and SAE J1850 bus (both PWM and VPW). Detects all Mercedes-Benz ECUs (electronic control units) installed in car and reads all diagnostic fault codes. See also: Mercedes-Benz CAN-BUS network.